Generating invoices has never been easier – setup automatic invoicing or do your monthly bill runs with just 1 click. Make sure invoices are received – choose who should receive invoices and automate the process of sending them. Collect online payments with ease – use OfficeRnD’s payment integrations to collect online payments via CC or ACH (Direct Debit), bringing down the time (and cost) to charge members. Send overdue reminders and payment failure notifications automatically. Configure detailed (and customized) automatic receipts showing members a break-down of their purchases. Spend the same effort you were spending when you had just 1 location by invoicing different Billing Entities from a single OfficeRnD account. Save time and leave no room for error by having to update multiple accounting and payment accounts. Connect each of them to a separate (or multiple) locations in your OfficeRnD account. Access data and reports on all (or separate) locations to get the info you need to scale. Ensure the consistency of the invoicing experience of your members by defining unified invoice and notification templates and using them across multiple locations. 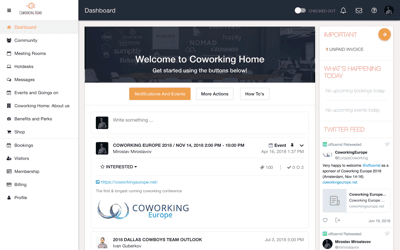 Maintain up-to-date accounting records with a real-time, two-way connection between your coworking software and accounting system. Invoices issued by OfficeRnD will be populated with the next available invoice number, making sure that you and your accounting team keep your current operational process and don’t face a steep learning curve. Follow the links to get more info on our Xero and Quickbooks integrations. Keep a consistent and professional look through every step of the invoicing experience. Customize the look and feel of your invoice templates, system notifications, emails, and payment receipts. Allow members to access all things billing from the Members Portal – updating billing details, paying or accessing invoices is now one click away for them. Want to see OfficeRnD in action? We’d love to chat and see if we’ll be a good fit for you. Book a 1:1 live demonstration with our team now!